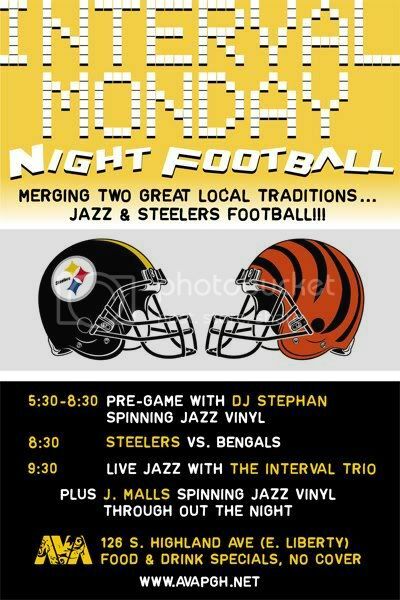 Join us this week as we merge two great local traditions, jazz & Steelers football. The Steelers only have one Monday night game this season (this week ... Monday), so come and watch it with us at AVA Lounge! Fun starts at 5:30 PM w/ our new pre-Interval jazz happy hour overseen by DJ Stephan of the New Pittsburgh Courier. Game starts at 8:30 as I take over jazz vinyl duties. Then we move on to live jazz with the Interval Trio & friends!! Plus there's food & drink specials, still NO COVER!!! RSVP for Interval Monday Night Football to add comments!